I was looking through my photos folders this afternoon and I came across these pictures and they brought back wonderful memories! Bloggers' meet-up for the first time for me ever since I started blogging in January 2008.. almost going to be 6 years! 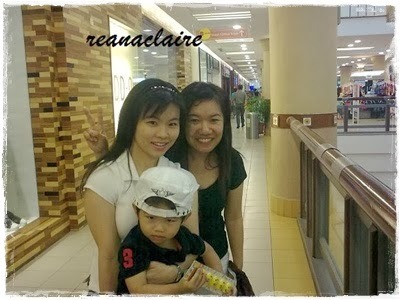 Remember meeting this famous mother and son in 1Utama in Dec 2009.. Such sweet ladies with Small Cat... that time he was really small, right? I remember receiving a phone call from my SIL..
"Pestering" us to go home for dinner! Well, looking back and now, we truly have gone through a lot, didn't we? Life is very fair, right? Hey!!! We also met for the first time in 2009!!!! So when will I see you again...??? knew all those famous mums. haha. yaloh, their kids all grown up. Time flies. All those sweet memories. rose: so you know them all, right! cleff: i also got a picture of you.. but u sure wont let me put up one.. i know.. hehee..
irene: yes.. one day both of us must take a picture together!! p/s the comment deleted by author was posted by me.. suddenly realised I was using my bro's account.. hehehe..
Time for you to meet them again? Hah, sure bring back lots of good memories! Ohh..that photo brought back a lot of sweet memory. I thought that was my first time meeting mamarazzi too, if not mistaken. Then met you at Ipoh and we went for a short vacation to Sibu. That's awesome!